Jalal ud-din Akbar was born in 1542 to Humayun, in India, while the latter was a fugitive ruler. 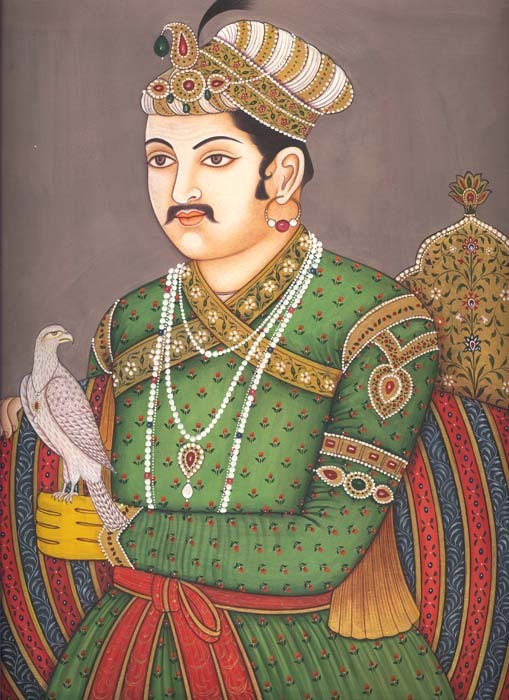 Akbar succeeded to a very shaky throne at age 13 but went on to enjoy a long and successful reign, becoming the greatest ruler of the Mughal (Moghul) Empire founded by his grandfather Babur and his followers, who were Muslims from Central Asia. Akbar spent much of his difficult childhood on the run. Consequently, he never learned to read or write. However, he was a brilliant man with an inquisitive mind and phenomenal memory who had others read to him throughout his life. 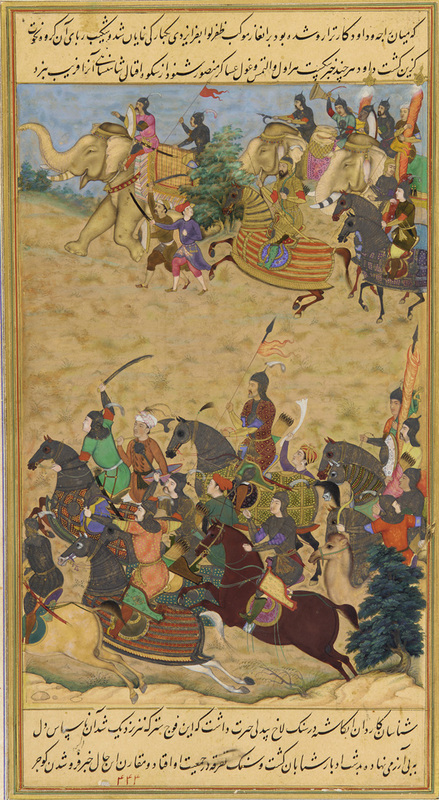 Akbar’s leadership highlighted his diverse achievements. He was a good general who expanded his empire after personally leading troops to defeat the powerful Hindu Rajput warriors. Then he married a Rajput princess, daughter of the ruler of Amber; she would become the mother of his heir. His lenient treatment of the defeated Rajputs, whom he kept as his vassals, foreshadowed his policy toward other Hindu subjects. In 1572, he conquered Gujrat, thereby gaining access to the sea. When he encountered the Portuguese, he grew to admire their ships, arms, and European merchandise. In 1573, he signed a treaty with the Portuguese viceroy ensuring safe passage for Indian Muslims crossing the Indian Ocean on pilgrimages to Mecca. Later he added Bengal, Baluchistan, Afghanistan, Kashmir, and part of the Deccan region to his empire. Like his grandfather Babur, Akbar was a builder. In Delhi, the tomb he built for his father was constructed of red sandstone and adorned with white marble, the precursor of the mature Indo-Islamic style of the taj mahal. He also built a fort at Agra from red sandstone. Above all, he was noted for building a new palace city at Fatehpur Sikri near Agra, close to the retreat of a Muslim holy man and his mentor. Built of white marble, it became his head-quarters until 1585, when he moved away and the palaces were never occupied again. Akbar’s national policies aimed at uniting his subjects. The centerpiece was religious tolerance, partly the result of his disillusionment with Sunni Islam’s rigidity and intolerance and partly to conciliate his Hindu subjects. Thus he abolished the poll tax on non-Muslims and the special tax on Hindu pilgrims. He hosted religious debates of Hindu, Muslim, Parsi (Zoroastrian), and Christian (Jesuit) scholars at Fatehpur Sikri and concluded that no religion held the exclusive truth. Attracted by mysticism he also took up Sufi Islam and Hindu yogi practices. Akbar eventually established a new religion called Din-I ilahi, or Divine Faith, in 1582. With Akbar himself as spiritual guide, Din-I ilahi was drawn mainly from Hinduism, Jainism, and Zoroastrianism. Orthodox Muslims were offended and accused him of heresy. He ruled as an autocrat served by ranked officials who were given salaries. However, 70 percent of his officials were foreigners, mostly Afghans and Persians, and Persian was the official language of his empire. The rest were Indians, both Muslim and Hindu. The employment of some Hindus in government service was an improvement in the status of Hindus from previous Muslim dynasties. He abolished tolls, made roads safe, and kept dues low to encourage commerce. Akbar was a patron of the arts, and culture flourished during his reign, enormously impressing the Europeans who visited India at the time. His last years were saddened by the death of two sons from drinking and drugs, and by the revolt of his eldest son and heir, Selim (Salim). Similar troubles also plagued his successors, who faced revolts by their sons and civil wars among them.